Let's play 'Have You Ever'. 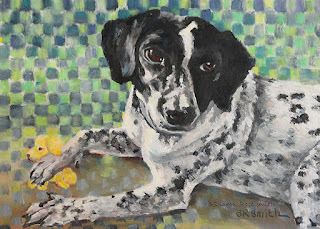 Have you ever painted a spotted dog? YES and what fun, especially this soulful little fellow clutching his very own puppy. For even more of a hoot, I added all-over squares. I have been off on some adventures. Recently, I have come home to painting.